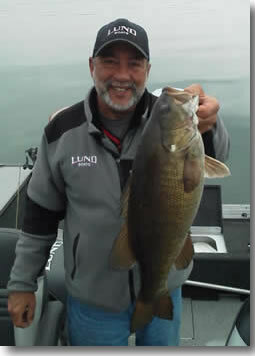 Western New York’s premier Bass Fishing Guide Service-Lake Erie, Lake Ontario, the Niagara River & NY inland Lakes. Come join me, Terry Jones, Fishing Guide,for a day of great bass fishing action. I have over 30 years of fishing experience in western New York and over 20 years as a bass fishing guide. I have tremendous knowledge of the area waters. My experience will put you on the fish and give you a day to remember. I am a full-time BASS fishing guide. I am not a multi-species guide. I guide for BASS FISHING, both smallmouth and largemouth. All bass fishing is catch & release only! I don't fish for Walleye or Trout. If you wish to fish for these species, I can find you the right guide. If you want to catch BASS-you are definitely in the right place. My trips are family friendly and a great way to spend the day. Bring your family, your friends, your neighbors, the guys at work or your customers, I will do my best to make sure you have a great time. Fishing is a great way to build relationships. Motor Guide Xi5 36 volt 105lb thrust trolling motor. All tackle is included in the price of the trip. My tackle is the best in the industry. My mission is to provide my companions with a safe, pleasurable action packed fishing experience. To increase the “luck of the day” I draw knowledge from experience of the waterways and habits of the species pursued. FISH GUARANTEED. I let you fish the front of the boat. My job is to guide-not to fish. I approach each charter as though I were going fishing with a buddy. Give it a try. At the end of the experience you'll feel a little tired, a lot refreshed, excited to share the stories with friends and family and eager to do it all over again. If you're interested in hard hitting, tackle busting, smallmouth bass fishing and you are from the Western New York area or you are planning a trip to visit the area soon-please be sure to complete our Online Information Request Form so that I can help you plan the fishing trip of a lifetime.